HJ limps. Hero raises to $.2. Only HJ calls. HJ bets $.23. Hero raises to $.8. HJ folds. Should I have c-betted on the flop? I chose to raise on the turn to price out draws. Was that a sensible move? If he's a player who'll fold too much, bet, if not, checking back in this spot is fine. The turn raise is good, but not to 'price out' draws, you want draws to call you. You're raising because you likely have the best hand and there are numerous weaker hands that will call. Important is not hit or miss - still, it's very board dependent as well - but your overall strategy. Could you clarify on your last comment please? I don’t fully understand you. If he's a player who'll fold too much, bet, if not, checking back in this spot is fine. What if the Villain is balanced? As played on the turn the only reason to raise are if you can get worse hands to call or better hands to fold / and posoably fold out some equity. ....I just call and call his river bet (on a safe card) the same money goes in but he can keep bluffing...if he checks you have poskitoin and can then go for some value. Sorry, my limited English (3rd language) is sometimes confusing. Think about what is a "hit" ? It's not only how your hand / range connect with the board for you to get a made hand, but also how Villains do too. T54r seems a miss for Hero: in our range, we may have only 3 sets of TT, few TP, many overpairs (JJ+), and no draw (except ev. backdoor). And KQo does give us only overcards. MP will but miss this flop often too: only TT, TP and weak pairs are made hands - and let's give some bad draws like naked gutshot. So there is still much junk (hand which didn't connect and are not that great) in his range. Now everybody knows or can guess than it's hard to have a strong made hand on T54r. So against a c-bet with perceived none made hands (like KQo), Villain can either float too often with junk or fold too often (allowing H to . In this case, KQ is a hit: we are ahead of much of the junk V may float with, and we still have 2 overcards against any pairs V got on the flop. 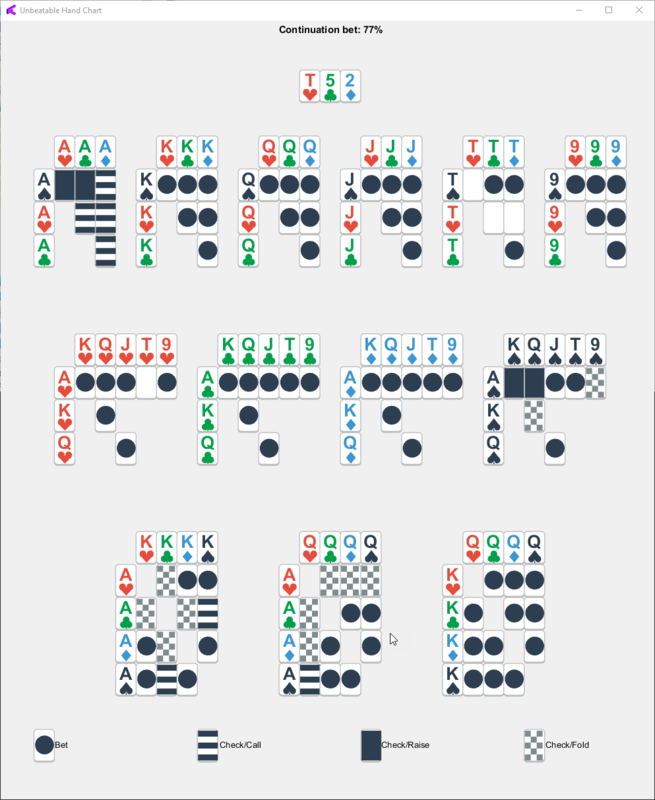 On the contrary, KQo will be a miss on 8c7c6h, because this board smashes V's range: we can expect V to often call/float AND with strong made hands or hands with great equity. In this case, KQ is a miss, we are badly behind. In your title, you said "C-betting with KQo when missing the flop". My point was that, IMHO, you did NOT miss the flop. I’ve heard of this concept before but I didn’t fully understand it the first time I saw this. Based on your analysis, it sounds as if the main advantage that Hero has is just having overpairs, am I not mistaken? If I am correct, then there are only 24 more combos that hit the board more than Villain’s. Relative to the total number of combos both Hero and Villain have (since Hero is on the BU), 24 is a rather small number. How many combos do you figure V has here? I would guess that Villain has SC, suited 1 gappers, mid to low PP, and low broadways. With the SC, I would guess that Villain has about 20 combos (54s up to T9s). With the suited 1 gappers, I would guess that Villains has 20 combos (64s to J9s). With the low to mid PP, I would guess Villain would have 42 combos (22 to 99). With the low broadways, I would guess that Villain has 33 combos (JT, QT, QJ). This would give a total of 115 combos. However, I am not very confident with my hand reading skills so I could very well be wrong. Is this hand reading consistent with that of a typical 4 NL player? I don't know the player pool, but would think many players sufficiently dislike playing OOP they're going to limp-fold rather than limp-call some chunk of your suggested range. The other thing to keep in mind here is that it's not just how many combos in your range that are strong, it's the fact you have range advantage at all. So what range would you assign to Villain then? Even if you don’t know the player pool, I am still curious in hearing your thoughts. What do you define as a range advantage? As for range I'd trim off the small suited gappers and offsuit broadways. My first instinct was that I am indifferent to betting or checking. I then looked at the results from Ross' work with GTO+ and ranges. With his product, you pick a flop from the book that represents the flop you have. Lots of assumptions built into the book, but I would go with this. So I read the article twice and despite how clear the presentation of the topic is, it still hasn’t fully clicked for me. I understand that a range advantage means that the person either has more nutted hands in their range or has more turn cards that will help them but I don’t fully understand the cases with Aces and KQ other than folding Aces if a bad turn card comes. Could you clarify on those cases please? Also, just to see if I fully understand the concept of range advantage, in the hand that I posted, we have a range advantage we have more nutted hands since we have overpairs and sets that Villain doesn’t, and most turn cards are good for us such as a Broadway card, 5, 4, or 2. Did I get it right? Since @Doug Hull was on the podcast I linked to I'll let him attack that. When you suggest betting KQo on this flop, isn't that applying the book's advice to an unrelated preflop formation, the exact mistake the video preaches against? I would love some additional insight.. Yes, this is correct. The ideas in Unbeatable Poker should not be used to make decisions in a context that does not reflect the range and positional considerations on which the book is based. It's kind of like making a video critique of an unfinished book. This appears to be the M.O. of Mr. Lau, who recently gave a detailed and entirely negative review of the Sweeney-Jones "Optimizing AK" book, despite the fact he had only read two pages of it from the promo on Amazon. In my capacity as RCP Community Manager I'm flattered Mr. Lau continues to spend so much time and effort denigrating RCP-related material from such minimal information. His interest in us seems almost obsessive. This apparently stems from the time he was a member of this forum and chose to launch unprovoked ad hominem attacks on forum members and mods, which led to him being banned. One may not always appreciate his style, but is Lau factually incorrect here? I'm inclined to agree: The book that Doug recommends using here is a book that begins with unrealistic preflop ranges and recommends decisions for OOP play - how on earth is that supposed to be a tool to be used for the recommended moves in this situation? Perhaps @Doug Hull can comment on this... would be really interested to hear a response. Without some sort of sensitivity analysis on how GTO decisions change between, say, a 17% IP flat and an 8% IP flat, or an OOP raise/call and an IP raise/call, using this book in this spot seems like a classic case of garbage in garbage out. As far as I know, Mr. Lau cannot be correct or incorrect here since he hasn't commented on this thread. The author of the book has responded and indicated that Doug's application is likely stretching the results beyond the realm of applicability. I can add that, unlike Mr. Lau, I've read the entire book, and can tell you these kinds of issues are explicitly addressed. When I said here, i meant "here" is in "in Lau's critical video". 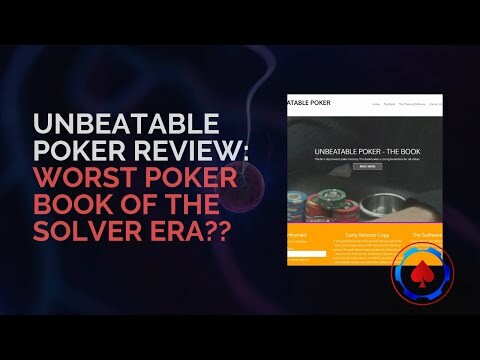 While I wouldn't use the same harsh wording that he does, I actually agree with Lau that the preflop ranges in the book are extremely unrealistic, do not actually show the power of solver simplification by comparing different bet sizes, and the charts are generally extremely unhelpful to someone trying to "humanize" solver discoveries. Also, (let me re-emphasize that I'm not trying to be a jerk) saying "these kinds of issues are explicitly addressed" doesn't really let the author avoid criticism for an unhelpful book. If I write a book on a GTO game approach where I assume that villain is always opening exactly two red cards UTG, I can do the fanciest analysis ever in the book, but if I market the book as "a method to achieve poker mastery", then receive criticism that the book is useless in a casino, and respond by saying "I stated my assumptions up front, don't stretch the book beyond its context, and I explicitly address these assumptions in the introduction", then I as the author shouldn't really expect that response to invalidate the criticism. Got it. What Lau fails to mention, either because he hasn't read it or because his agenda is getting in the way, is that a chunk of the book is devoted to the question of sensitivity to assumed ranges. As to whether the base ranges are realistic, again the book details why they are used and presents data-driven evidence for why they are reasonable. I completely agree with your point that all criticisms should be judged on merit. The issue is that here, like the AK book (not to mention another video where he chooses to go after our preflop OR charts which are manifestly no better nor worse than anybody else's), Lau "criticizes" through the scoundrel's trick of selective quotation and taking material out of context. This is simply intellectually dishonest. I will openly admit that I have not read the section of the book that defends why a 7.5% vs. 19% range analysis is used. What is the basic defense? In my opinion, I can't imagine a scenario where this would be realistic. What game is soft enough that my opponents are calling THAT wide, and I am somehow still only opening 7.5% of holdings? As for the sensitivity of the ranges, does Glover write in that section that your actions change drastically if the IP caller is calling with a tighter (and, arguably, more reasonable) range? -7.5% vs. 19% isn't a reasonable premise. -using a single bet size in a solve leaves ambiguous amounts of EV on the table. 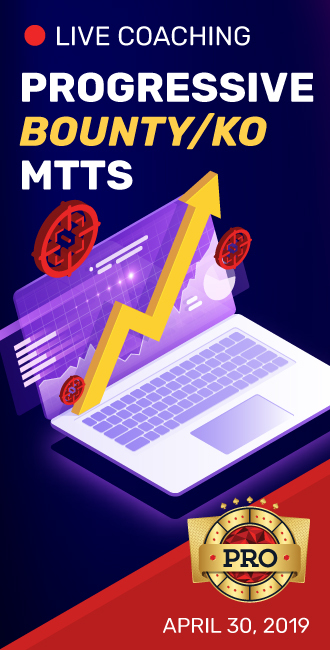 -the charts are basically impossible to memorize and don't provide a strategy for how to think through a given scenario. Are any of those out of context? I mean, really, I'd like to know. If he's misquoting or saying something that the book doesn't say, I will recant that I think he's argued his points well. Also, a complete side note, and maybe a debate for another day, but those preflop OR charts are pretty objectively bad, esp. for high rake games. I don't even think that's arguable. To be perfectly frank, I am an above-average 5/10 player (point being that I'm not a high stakes pro), and if you forced a high stakes pro to play those PF charts (not 3betting JJ out of the SB is honestly a crime against poker), I could probably beat them. Someone could download the free pokersnowie app and have significantly significantly better preflop play than those charts provide. Add to that the fact that terms aren't even defined well (what range is a "tight" raiser and a "loose" raiser, and are these really good binary classifications? ), and there's very little in these charts to recommend.